Paulo Sergio is very keen on returning to Hearts as manager following the sacking of Ian Cathro, forwarding his CV on to the club’s owner Ann Budge after hearing the news. For Hearts fans, who became increasingly agitated as the Cathro era went on without any sign of improvement, the promise of a former hero returning to EH11 would be quite the boost. 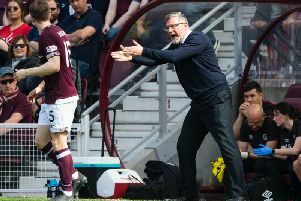 Sergio will forever be a legend in the eyes of the Tynecastle faithful for masterminding the 5-1 Scottish Cup final win over Hibs, even if his respect for the opposition denied Hearts the chance to run up a cricket score on their well-beaten rivals. Bringing the Portuguese coach back would be a great PR move by the club, but would he be the right person to take this team forward? The Romanian champions were fond of the odd managerial change, having replaced Jorge Costa with Ioan Andone with only a few weeks of the 2011-12 season left. Fortunately for them, the move worked, as Andone led the club from third place to top spot at the end of the season. The former Romanian centre-back then took the club into the Champions League group stages, where they were drawn against Manchester United. When Andone stepped aside following some disappointing league form, the stage was set for Sergio’s greatest triumph in his post-Hearts career. Cluj went to Old Trafford needing a victory to keep their hopes of reaching the last 16 alive and stunned Alex Ferguson’s side with an unlikely 1-0 victory. It wasn’t enough to get into the knockout stages, as Galatasaray dispatched with Braga to clinch second place, but they dropped into the Europa League where a very respectable 10 points earned from their six UCL Champions League group matches. It was all downhill from there. Following the winter break, Cluj exited European competition with a home-and-away two-legged defeat to Inter, and failed to win any of the first seven league games in 2013, prompting Sergio’s exit. Sergio was back in management the following season, taking over the Cypriot champions. During the summer recruitment drive, he signed a couple of players familiar to Hearts fans: ex-Kilmarnock striker Cilian Sheridan and current Jambos attacker Esmael Goncalves. In the end, Sergio was only granted four league games with the club, but it was his efforts in Europe which prompted his exit. The side exited the Champions League qualifiers at the first hurdle, losing on away goals to Maribor in Sergio’s first two games. They then went out meekly again, this time in the Europa League qualifiers, as a home defeat to Belgian side Zule Waregem was a blow to big to recover from in the two-legged tie. Miraculously, it wasn’t the end of the club’s European campaign. A banning order handed down to Fenerbahce for a match-fixing scandal saw APOEL enter the group stages of the Europa League, having been drawn at random. For Sergio, it was more a curse than a blessing. Failing to win either of his first two games in the group stages, he was relieved of his duties following a 3-0 home defeat to Eintracht Frankfurt. When Sergio first walked through the doors at Academica, the humble Portuguese side were coming off an impressive 2013/14 campaign where they finished eighth under former Lazio winger Sérgio Conceição, who had left to take over Braga. What was to follow was a lesson in enduring frustration for Sergio, whose side didn’t lose a whole lot of games - they just didn’t win many either. An incredible 12 draws and only one league victory convinced Sergio to resign in February. Youth coach José Viterbo took over and won three of the next four games. Even though their form would crash once more, six defeats in a winless 10 game stretch to finish the campaign, that initial post-Sergio bounce was enough to keep Academica up. This was Sergio’s toughest task, and he didn’t fare any better. It was always going to be difficult to improve the fortunes of a side who’d finished 10th the season before (in a 14-team league) just three points above the drop zone. However, he probably would have felt better about his time in the Middle East had he won any of his 11 games. Once more, the club managed to scrape together enough points to avoid the drop after Sergio’s departure. Contrary to what Wikipedia may have you believe, he never actually led the team from Iran. He agreed to take the job, but the move fell through after his contract was revoked.